FCWisconsin.com's ‘Where Are They Now’ feature, provides FC Wisconsin club members with an opportunity to catch up with former players. 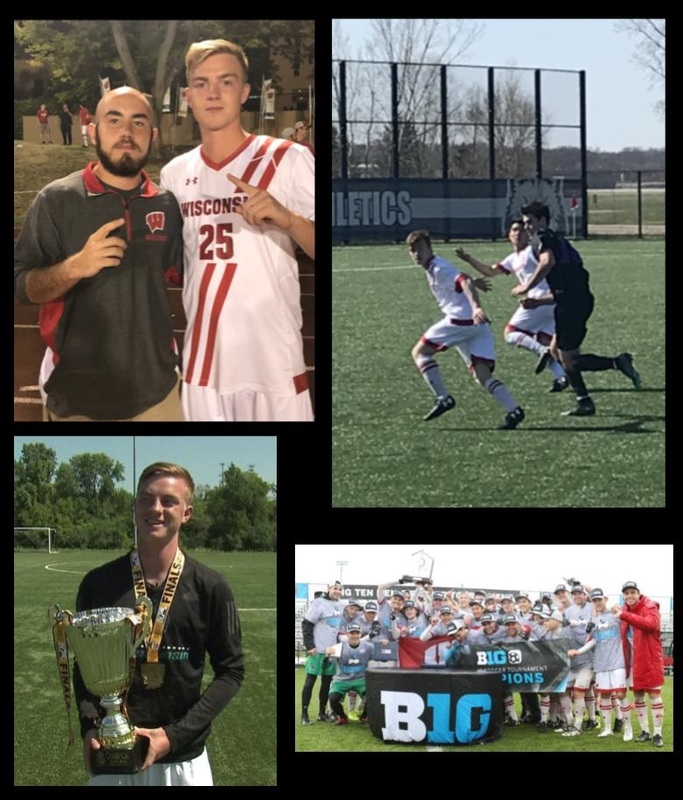 In this installment, we catch up with last years NPL National Championship winning Captain Ben Leas who has just completed his first year as a member of the Wisconsin University Men’s Soccer Program. I started my time at FC as an 8-year-old and played with FC for a total of ten years. I wanted to join the club because I wanted to train in an intense environment that would help me pursue my dream of playing college soccer. FC had a history of generating the best players in the state, so I knew that if I wanted to reach my potential FC Wisconsin was the place for me. One of the biggest benefits to playing at FC was how the coaches put player development first. This was particularly important, as I got older. I had coaches who genuinely cared about my success and about my development. The coaches taught us how to play the game the right way, a way that would maximize our growth as players. One of the best aspects of my FC experience was showing up to training every day. It may sound simple, but FC created an environment where I was excited to show up to training every day. The trainings were intense, and every player on our team was bought in to training and bought in to what the club was trying to accomplish. This made training a great environment, and I got closer with all of my teammates because of it. I learned a lot at FC, but one of the main things I learned was the importance of hard work and fitness. The standard set by the coaches created an environment where the most was demanded out of you at each training session. The coaches held me to a high standard, so I then held myself to that same standard. If I had an off night at training, I was motivated to work on my own and focus at training to be better the next night. The coaches would make the point that one thing you can always control is your fitness level. I always made fitness and work rate a priority of mine in training and training on my own. Once I was a fit player, the game opened up and became easier. One of the major differences between playing club and playing in college is that there is less of a focus on development, and more of a focus on winning games. Along with that, in college there is a lot of competition for roster spots and starting spots, and trainings are very intense because of that. In Club the coaches will try to develop every player no matter their talent level coming in. It might not be the same in college because the coaches have less patience and want to win at every moment. Coming from FC where I had already been challenged both mentally and physically has really helped me adapt to this environment. From all the memories I made during my time at FC, the lasting memory came from my very last year with the club. My last year in 2017 we won the National Championship. It was an unbelievable experience and one that I will never forget. It was a culmination of all the hard work we had put over the years. It always makes me think about how during my U14 season, we didn't win a single game in the fall. However, four years later we were national champions. This only became possible because the players and coaches were all bought in and believed we could achieve something great. Over, those four seasons we continued to grow as players and leaders. We improved each season, so by our last season we were prepared for college soccer and proved it by becoming national champions. It was one of the most fulfilling feelings knowing that all the work I had put in with the club since the time I was 8 years old had paid off with a national championship to show for it. Q. How did playing and training at FC help prepare you to have such a successful first year at the collegiate level? FC prepared me well because of the intense training environment. At my first training session in college I didn't really know what to expect, but by the time it started I felt at ease because I had seen a similar environment before. I had competed and gone into hard tackles at that level at FC, so I wasn't shocked or scared by the intensity of training. The coaches at FC also trained me very well as a defender. I hear my college coaches preaching the same messages that the FC coaches have instilled in me over the years. One of the best things I ever did for my career was I became best friends with players at the club that pushed me and motivated me to become a great player. They demanded the most out of me and became a huge part of my success. So, surround yourself with players and people that will push you and help you maximize your potential. Along with that, come to training everyday ready to compete and give your best. That is what is expected at the collegiate level, so if you can make that a habit now, it will only help you. Another that is important is to control what you can control and the two main things are fitness and work rate. If you're working your hardest in training and outside of training, you will start to notice a difference in your overall game. The thing that makes FC standout from the rest of the clubs is the sense of family you gain from being a part of the club. I hinted at this earlier with talking about how the coaches genuinely cared about my success. FC made me feel welcome during my time there, and the players and coaches truly became family to me. The club cares about your success in soccer, but also realizes that there are other components to life outside of soccer. I am truly able to call FC a home to me, and I remain in contact with the players and coaches there. It is something that no other club could have done for me and is what truly separates FC from the rest.